Jawatan Kosong di Training Cube International Sdn. Bhd. 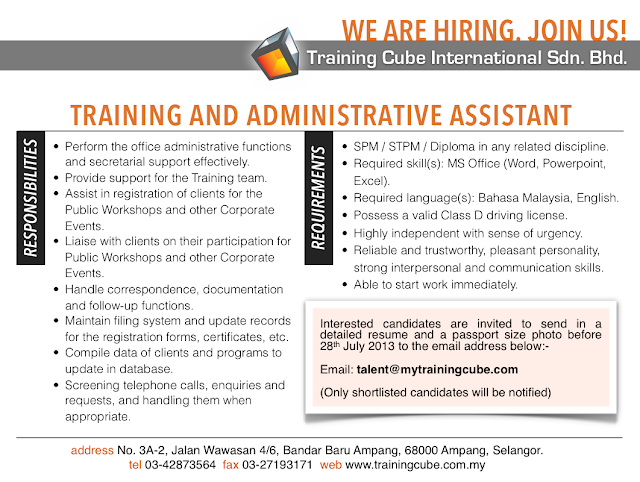 Perform the office administrative functions and secretarial support effectively. Provide support for the Training team. Assist in registration of clients for the Public Workshops and other Corporate Events. Liaise with clients on their participation for Public Workshops and other Corporate Events. Handle correspondence, documentation and follow-up functions. Maintain filing system and update records for the registration forms, certificates, etc. Compile data of clients and programs to update in database. SPM / STPM / Diploma in any related discipline. Required skill(s): MS Office (Word, Powerpoint, Excel). Possess a valid Class D driving license. Highly independent with sense of urgency. Reliable and trustworthy, pleasant personality, strong interpersonal and communication skills.